Ask any student of military history about the effects of the April 1942 Doolittle Raid on Tokyo, and the answer will inevitably be that, while the physical damage it inflicted might have been paltry, its effect on the Japanese psyche was, to say the very least, shattering. They had, until then, believed their sacred homeland to be inviolable. Doolittle’s attack with sixteen carrier-launched B-25 Mitchell medium bombers proved otherwise, and its effect was incalculable. It never mattered that all sixteen aircraft were lost. They had given the Japanese a foreshadowing of the horrific revenge that was soon to visit and all but obliterate them. As for the raid’s effect on the psyches of the American military, the answer is not quite so simple. Certainly the Doolittle Raid showed the virtue of the audacious act. Even so, they remained institutionally wary of operations planned and executed on the fly. But for the Navy, it was a very odd sort of eye-opener, which was brought back to mind after World War II had ended and the atomic age had begun. Aircraft carriers might have been key to winning the war in the Pacific, but with the dawning of the nuclear age they faced whole-scale irrelevance. It appeared all future wars would be waged not by carriers, but by nuclear bombers. Desperate to stay in the game, the Navy’s solution was straight out of the Doolittle playbook. The P-2V Neptune, the Navy’s new land-based, maritime patrol bomber, could be modified to carry nuclear bombs, and then launched from carriers to attack targets in the Soviet Union. The twin-engine P-2V was larger and heavier than a B-25, but, with the assistance of JATO bottles (Jet-Assisted Take Off – actually rockets), it could be launched quite handily from a carrier deck. Of course landing was another story. Since the Neptune’s landing gear was not robust enough for a carrier landing, in the unlikely eventuality that an attacking aircraft actually made it back, the plan was for it to head for a friendly airfield, if one was in range, or ditch near the carrier and await rescue. About a dozen P-2Vs were modified to be launched from carriers. The Neptunes were returned to their normal maritime patrol duties when the AJ Savage composite piston/jet powered bomber was adopted. The Savage was built to be launched and recovered from a carrier deck with the nuclear role in mind, but jet technology made it obsolescent practically from the time it reached squadron service. The introduction of the A-3 Skywarrior, a nuclear-capable jet bomber designed from the outset for operations from a carrier deck, finally gave the Navy the aircraft it wanted, and other nuclear-capable jets followed. That might have been the end of the whole idea, but a new problem was already presenting itself. By the end of the 1950s, the Navy’s aircraft carriers were spending more and more time globally deployed, often very far from land. 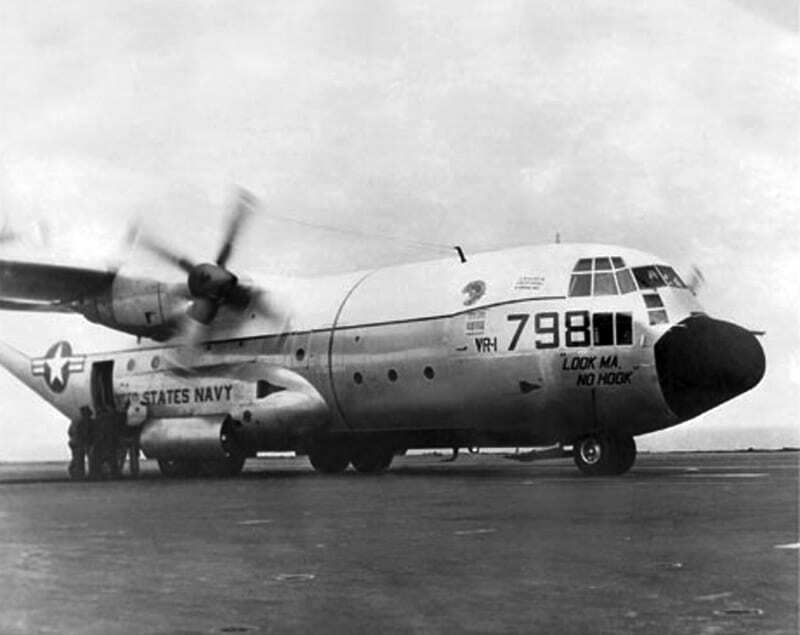 Special twin-engine carrier on-board delivery (COD) aircraft had been developed to bring them key supplies and passengers. The first of these was the Grumman C-1 Trader, which could carry nine passengers or 3,500 pounds of cargo. The C-1’s range was similarly limited, however, which meant that any time a carrier was more than 300 miles offshore, it was beyond the C-1’s range. In 1963 the Chief of Naval Operations ordered a feasibility study as to whether a larger aircraft like the C-130 might do the job better. The assignment of proving the feasibility of operating a C-130 from and aircraft carrier went to Lt. James H. Flatley III, son of a Navy legend and a test pilot from the Naval Air Test Center at Patuxent River. The crew would include Flatley as pilot; Lt. Cmdr. W. “Smokey” Stovall, copilot; ADR1 Ed Brennan, flight engineer; CPO Al Sieve, crew chief; and Lockheed test pilot Ted Limmer. Since the Navy didn’t have any C-130s of its own, it borrowed one from the Marines; a KC-130F tanker. The refueling pods were removed, the nose-landing gear stowage was modified, and an improved anti-skid braking system was installed. There was no tailhook. On Oct. 30, 1963, Flatley and his crew of four flew out to a spot five hundred miles off the coast from Boston, where the USS Forrestal was waiting. Conditions that day were far from ideal. The seas were moderately rough, and they were facing 40-knot winds. Flatley’s biggest concern, though, was that the aircraft would not manage the maximum nine foot-per-second sink rate. But the Hercules did fine. The secret, he later said, was the excellent coordination he had with Landing Signal Officer Jack Daugherty. When the aircraft was still three or four feet off the deck he got the “cut” signal from Daugherty to pull the throttles back to idle. A second later, the aircraft touched down and rolled to a halt at a spot exactly even with the captain’s bridge. 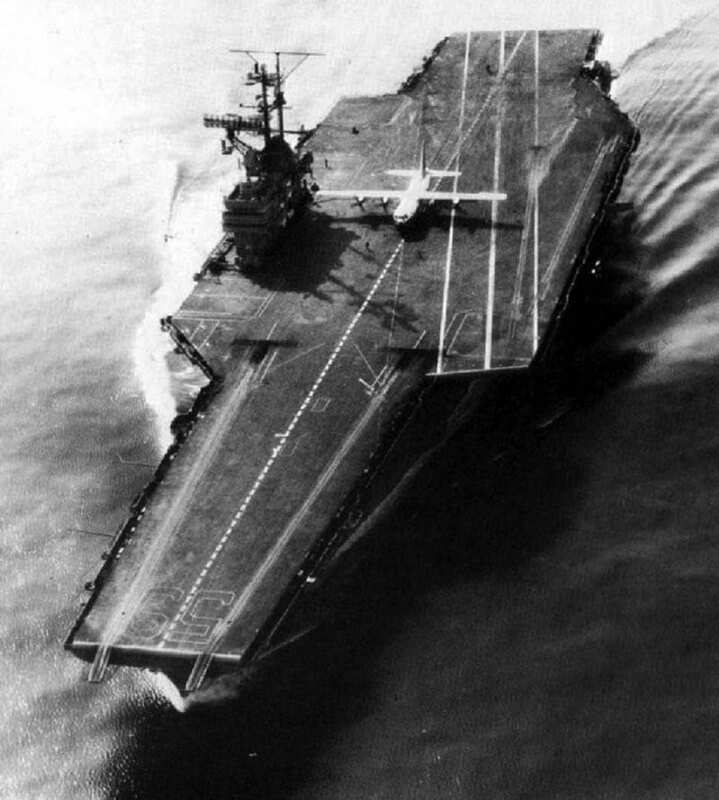 The tip of the starboard wing was only fifteen feet away from the carrier’s island. The captain and the others stared at the aircraft, still totally amazed that it had put down on their deck without destroying everything around them. Over the next couple of days, Flatley and his crew made twenty-nine touch-and-go landings, and twenty-one full-stop landings and unassisted takeoffs from the Forrestal’s deck. 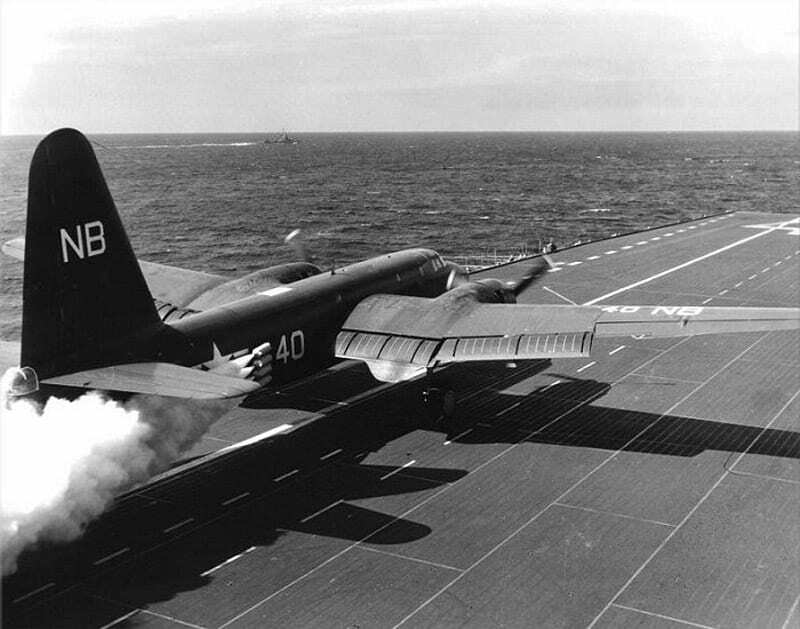 In most instances the aircraft would touch down about 150 feet from the end of the deck, roll for a little under 300 feet and then take off from the same position, using what was left of the deck, leaving a couple hundred feet to spare by the time they lifted off. The aircraft took off with loads of between 85,000 pounds to 121,000 pounds. Although Flatley’s flights demonstrated that C-130s could perform the COD role, the Navy instead picked the Grumman C-2 Greyhound, which had bigger capacity and better range than the C-1, though nothing like that of the C-130. For his efforts, Flatley was awarded the Distinguished Flying Cross and the Air Medal and was a rear admiral by the time he retired in 1987. Stovall, Brennan, and Sieve received Air Medals. 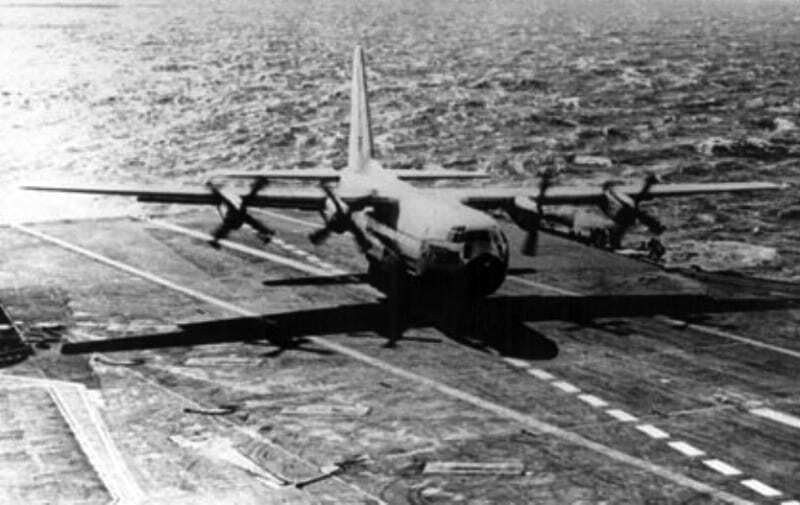 The idea of landing C-130s on carriers was briefly resurrected during the Iranian Hostage Crisis of 1980. A bold and very risky program called “Operation Credible Sport” was developed, in which a radically-modified C-130 would be flown into a Tehran soccer stadium, loaded with rescued American hostages and then flown out to a waiting carrier for offloading. One of the test aircraft, however, was destroyed during a test, and the operation was cancelled. In the last thirty years, there has been no further discussion on the subject. Flight Journal magazine several years ago had an article by Flatley in which he gave most of the credit for the support for the concept to JFK, who apparently was thinking of operations in the Indian Ocean which required longer resupply missions than the C-1 and C-2 were capable of. The last flight was November 22, 1962; the day JFK was killed, and without his support the program ended almost immediately. Given the improvement in engines etc, greater payloads ought to be possible if the concept were revived. But it wasn’t the last time the Navy looked at a relatively large aircraft for COD that was already in production. We’re working on another article about a proposed COD aircraft that might surprise you. Wasn’t the Boeing 737 airframe also considered for COD missions as well? It wasn’t only considered, it was actually tested in field carrier landing touch and goes and possibly more, and as a matter of fact I’m working on an article covering that right now. The best part of the story is that the aircraft tested was supposedly already in its airliner livery and was delivered to the airline after the testing! Great article! I am very familiar with aircraft 798. As a KC-130 Flight Mechanic, I had the pleasure of flying 149798 on a regular basis at VMGR-352 at MCAS Miramar, and was honored to deliver her to her final resting place at the Naval Aviation Museum at NAS Pensacola in 2005. It was a great way to celebrate over four decades of faithful service to Navy/Marine Corps aviation. Thanks for sharing that with us, Nate. It was an incredible aircraft and a great moment in aviation history. Admiral Flatley- a great American! Proud to know him and his family! Jim Flatley was a guy I used to call up for insight back when I was a reporter at Inside the Navy. He’d retired from the Navy a few years earlier and was at that point working for Intermarine USA, which built the MHC-51 Osprey class minesweepers. A good guy, unlike most retired flag officers, he didn’t want to be addressed as anything but Jim. If only I’d known about the C-130 carrier landing. I’d love to heard his version of the story. Maybe someday…..